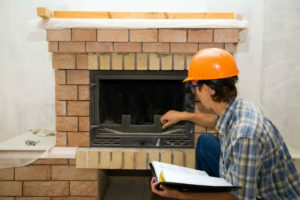 Gas fireplace maintenance is best left to the professionals. People love gas fireplaces because they’re convenient to use, easy to care for, and extremely safe. If you don’t want the hassle of purchasing, moving, and storing wood, then gas is the right choice for you. However, these appliances still require a little care and maintenance to keep them in top working order. Here are a few things you should know about your gas fireplace in order to keep your family safe. While also ensuring that your home is toasty and warm. Many people love the high-efficiency fireplaces because of their ability to heat a room. Limiting the heat up the chimney can lead to problems with condensation and the incomplete combustion of gas. The good news is that these issues are easily avoided with upgrades. Insulated liners, better connector pipes linking the furnace and chimney, and installing different liner sizes are available choices. Have you recently made the upgrade to a more efficient fireplace but these changes weren’t made? You should have your fireplace inspected to ensure that the entire system is working in an effective and balanced manner. You may be aware of the dangers of creosote, but you may not realize that even ceramic logs can gradually breakdown and leave behind a residue. While you may not have to worry about creosote, you should still have the system inspected. You’ll want to ensure that it’s still in top working condition and ready to warm your home. Over time, the gas connections and valves can develop leaks. The logs should be inspected to see that they’re still intact. A leak in the gas fireplace can potentially lead to a deadly explosion, but the great news is that these problems can be caught with a professional inspection. In addition to checking the primary appliance, we can also inspect the chimney to ensure that the airflow is adequate and the system is ready for use. Moisture can enter the chimney through cracks in the crown and lead to problems. Just as a gas oven needs to be cleaned and gas furnaces benefit from annual service, the gas fireplace in your home also needs a regular tuneup. With regular cleaning services, the logs can be dusted off, spider webs removed, and the space cleaned thoroughly. Gas logs are more fragile than you think, so it’s important to use soft bristles that won’t scratch or damage them. One of the great benefits of cleaning the fireplace annually is that you can have it inspected for damage or potential problems at the same time. This allows you to address minor repairs before they turn into major issues or safety hazards. We recommend that you inspect your fireplace and have it cleaned and tuned up at least once a year. We’re happy to provide this service, and you’ll appreciate our competitive rates. The Gas Connection can handle all of your inspections, repairs, and even replacement services so that you can enjoy your gas fireplace when the cool winter weather arrives. Contact us today with any questions!